MAHADISCOM Recruitment 2018 | 164 Deputy & Additional Executive Engineers. NOTIFICATION: Maharashtra State Electricity Distribution Company Limited (MAHADISCOM), Mumbai, Maharashtra inviting online applications for filling up 164 vacant posts of Executive Engineer, Additional Executive Engineer and Deputy Executive Engineer from eligible and interested willing candidates. It is latest & good information for unemployed personnel those who are looking for these new Jobs in Government sector & other organizations. Job seekers, who wish to apply for these vacancies regarding MAHADISCOM Recruitment 2018, must have passed Bachelors Degree in Electrical Engineering/Technology. Applicant’s upper age should be as per Govt. rules and age relaxation is applicable to all reserved category candidates i.e.SC/ST/OBC /PWH/Ex Servicemen/Women candidates etc. NO OF POSTS: 164 vacant posts of Executive Engineer, Additional Executive Engineer and Deputy Executive Engineer in Maharashtra State Electricity Distribution Company Limited (MAHADISCOM), Mumbai. 1- कार्यपालन अभियंता (Executive Engineer) (Dist. ): 37 posts. 2- अतिरिक्‍त कार्यपालन अभियंता (Additional Executive Engineer) (Dist. ): 37 posts. 3- डिप्‍टी कार्यपालन अभियंता (Deputy Executive Engineer) (Dist. ): 90 posts. 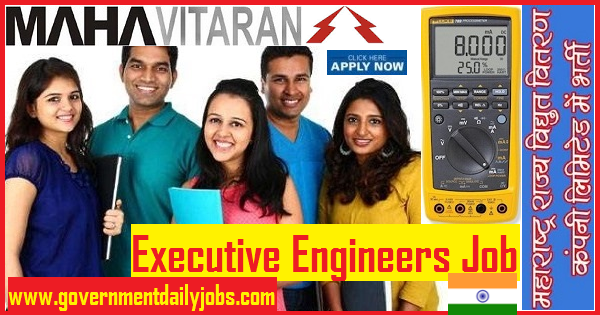 1- Executive Engineer (Dist. ): A passed of Bachelors Degree in Electrical Engineering /Technology from any University recognized by the UGC with 9 years post qualification experience in power sector.Out of which at-least 5 years in the area of power distribution as Additional Executive Engineer and Deputy Executive Engineer OR 2 years as Additional Executive Engineer. 2- Additional Executive Engineer (Dist. ): A passed of Bachelors Degree in Electrical Engineering /Technology from any University recognized by the UGC with 7 years post qualification in Power Distribution. 3- Deputy Executive Engineer (Dist. ): A passed of Bachelors Degree in Electrical Engineering /Technology from any University recognized by the UGC with 3 years post qualification in Power Distribution. 1. Executive Engineer (Dist. ): Rs. 31725-1220-37825-1385-68295/-. 2. 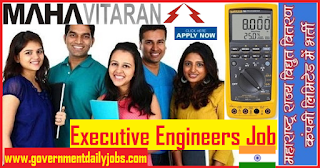 AdditionalExecutive Engineer (Dist. ): Rs.26710-1060-32010-1125-60135/-. 3. Deputy Executive Engineer (Dist. ): Rs.24010-975-28885-1060-54325/-. Note: The selected candidates are entitled to DA, HRA, Medical Benefit, Leave Encashment, CPF and Gratuity etc. as per the Rules of the Company. 1. Executive Engineer (Dist.) and Additional Executive Engineer (Dist. ): 40 years. 2. Deputy Executive Engineer (Dist. ): 35 years. REQUIRED APPLICATION FEE: For said vacancy a non- refundable application fee is to be paid by the candidates as per rules. An amount of Rs.500/- + Transaction Charges by General & OBC candidates and Rs. 250/-+ Transaction Charges by SC/ST/PWD candidates to be paid through online mode. POST RESERVATION: All reserved category candidates ie. SC/ST/OBC/ PWD/ Women /Ex Servicemen /Widows etc (as applicable) are being selected for said post/s as per existing Govt. policy/rules. कर्मचारी चयन आयोग द्वारा ग्रुप सी एवं डी स्टेनोग्राफर की भर्ती हेतु विज्ञापन जारी किया गया है। इच्छुक उम्मीदवार यहाँ आवेदन कर सकते हैं। आवेदन करने से पहले पूर्ण अधिसूचना यहाँ पढ़ें – Various vacant posts of Stenographers Grade C & D through Staff Selection Commission (SSC). LAST DATE TO APPLY: 19-11-2018. SELECTION PROCESS: Applicants who are screened for applicability /eligibility are being selected as per organization policy/rules depending on the basis of their performance in online test and interview at his/her own cost. The candidates will be short-listed for personal interview taking into consideration their performance and information provided in online application in the online test in the ratio of 1:3. The list of applicants called for the online test, short-listed for interview will be made available on the website of the Company only. Similarly the list of finally selected candidates will also be displayed on the website. Candidates to download call letter for online test: 10 days prior to online test. Online Examination at Test Centre: During November, 2018. Interview Process: During November/December, 2018. HOW TO APPLY: For said posts (MAHADISCOM Recruitment 2018 Apply for 164 Executive Engineer Jobs) eligible, willing and interested candidates may apply through online mode at official website up to last date. Applicants must retain a hard copy with them for future reference. 5. Complete the MAHADISCOM Application Form with the essential data. 7. Take a print out of MAHADISCOM Recruitment 2018 Online application form for future reference. CONTACT ADDRESS: Maharashtra State Electricity Distribution Company Limited (MAHADISCOM), Mumbai- Maharashtra. CONCLUSION: Maharashtra State Electricity Distribution Company Limited (MAHADISCOM), Mumbai invites online application for the recruitment of 164 vacant posts of Executive Engineer, Additional Executive Engineer and Deputy Executive Engineer on regular basis from Indian residents who are eligible & interested; candidates can apply through online application. LAST DATE TO APPLY: 06-11-2018 for MSEB MAHADISCOM Recruitment 2018 Apply Online 164 Executive Engineers Job.